It is really hard to get out and get fun pictures to illustrate the blog when it just rains all the time here in Meadows of Dan! Here I have tomatoes, lettuce and peas growing happily in my wet garden but no pictures to show and brag about. But then, I guess if you've seen one tomato plant you've seen them all! I've been dodging showers to get things planted but at least I can feel a bit better about all the rain, now that I have a garden! In spite of the rain we had a busy holiday weekend. Lots of people around for the Hit and Miss in the Mountain Festival. I didn't have a lot of time to see what was happening down there, since we had customers (thanks, everyone, for coming by!) but I did see a good many engines setting up and lots of crafters. There are some folks still down there if you're out in Meadows of Dan today. Music is scheduled for 2 to 4 PM if the weather doesn't get impossibly bad! 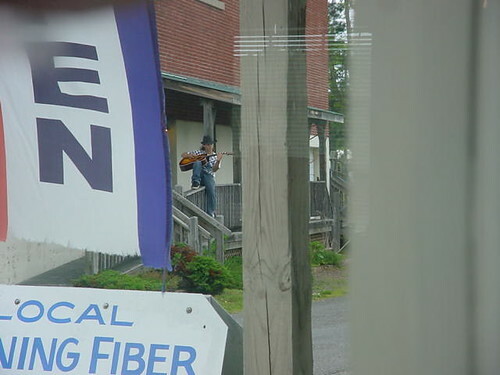 Speaking of music, I looked out yesterday afternoon and saw the young man pictured above out on my neighbor's back porch playing his guitar. I don't think he was involved with the festival but he stayed out there quite awhile. I was a little too busy to find out anything about him but I'm sure passing visitors enjoyed seeing him out there! As I suspected the new yarns and fibers I brought back from Sedalia last week have been very popular with customers. Quite a bit of angora blend yarn and some alpaca went home with customers this weekend. I hope I get to see some of the lovely things they create! A couple of felters came in as well, and some nice return customers from last year. Friend Jane has been spending the weekend with us, camping out in a tent in the back yard because she's allergic to Barnabas, the cat. Since she can't stay in the house, it's great to have something fun do in the evening. Saturday night another friend, Mary, was free to go with us up to Chateau Morrisette for a mini girlfriend get-away at the movies. This is our third time, I think, and we enjoyed it thoroughly. 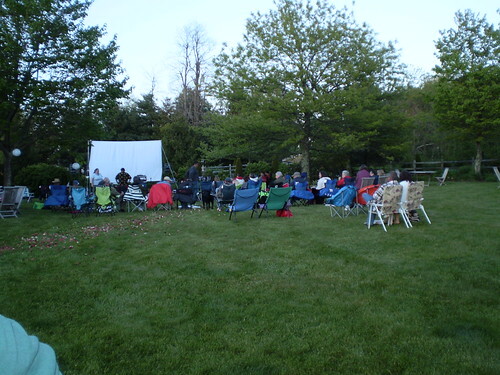 His Girl Friday, with Cary Grant and Rosalind Russell, may not be the best movie ever made but it was terrific under the cloudy skies on the lawn at the winery. Everything is funnier, and better, when shared with friends! There were other friends seated nearby, with their delightful little dog, and a friendly young couple we didn't even know to chat with. Friend Kym put the event together and she did a great job. The food was really good, service was excellent and with a smile, and the cost reasonable! I think the next show is Labor Day weekend, and we'll be there for the fun! It's raining today (no surprise) but already a few people have drifted into the shop. On my agenda for the day is to finish up this week's newsletter (Ok, I haven't even started it yet!) and I'm hoping to put some books online and on the web site. This weekend I managed to put some of the sparkling yarns created by Linda Wright of Wild Iris Wool on the site, along with some vintage postcards. Oh, almost forgot! 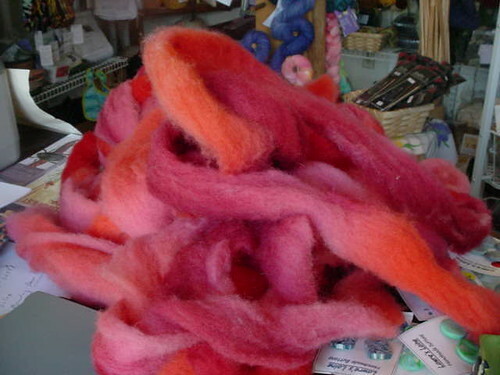 I did a dye day last Wednesday and it took awhile for the roving to dry in this wet weather. Very pleased with the results, though. This is the Texel roving I had processed at Central Virginia Fiber Mill from the fleeces Linda and I bought at Border Spring Farm. Nice so far! I'm hoping for another dye day this coming Wednesday. Come on over and bring your fiber!